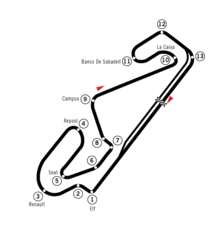 The 1995 Spanish Grand Prix was a Formula One motor race held on 14 May 1995 at the Circuit de Catalunya, Barcelona. It was the fourth race of the 1995 Formula One season. It proved to be the final race for 1992 Formula One champion Nigel Mansell, who quit the McLaren team after the race. Both Damon Hill and Rubens Barrichello experienced gearbox problems on the final lap, Hill dropping from 2nd (which would have kept him in the lead of the championship) and Barrichello from 6th. This gave the Benetton team their first 1–2 finish since the 1990 Japanese Grand Prix. This was the last race for Nigel Mansell. First podium finish: Johnny Herbert. ^ "1995 Spanish Grand Prix". formula1.com. Archived from the original on 2 November 2014. Retrieved 24 December 2015. ^ a b "Spain 1995 - Championship • STATS F1". www.statsf1.com. Retrieved 20 March 2019.